With an uncompromising commitment to quality, Metal Forge & Fitting Industries, the highly competent Manufacturer and Supplier firm of premier quality Flanges and Pipe Fittings, was established in the year 2012. 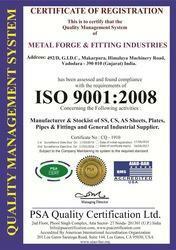 Being an ISO 9001:2008 certified firm we take pride in delivering industry leading product range such as Steel Flanges, Matel Flanges and Pipe Fittings that is specially crafted for demanding environments. Our products are widely acclaimed for improving the overall productivity, as they are manufactured using high grade alloys that perform efficiently for a longer time, without any requirements of maintenance and ultimately makes it cost effective. We are commitment to provide unparalleled quality products, thus we work jointly with our customers by listening to their specific requirements and develop products accordingly to meet their challenging expectations. Our offered products are serving to a wide variety of industrial segments including, infrastructure, construction, engineering, and manufacturing. We own a highly advanced manufacturing base with a support of hyper connected infrastructure that helps our efficient workforce to showcase their product knowledge and creative solutions. Our guide and mentor Mr. Mansingh Choudhary, is the key strength behind our success. His distinguished career in the fitting industry made him well versed with the complexities of manufacturing. He instructs us to work in a strong tradition of innovation and a consistent focus on sustainability. Under his valuable guidance we have become capable to earn inevitable trust of thousands of customers so far. Manufacturing, Trading, Importer and Exporter of Pipe Fittings, Tubes and valves. We foster a high technology work environment that enables us grow continuously. Our manufacturing base is housed in spacious vicinity, and backed with latest equipments and machinery to support the ever growing product demand. Due to hyper connected infrastructure we are serving the needs of our clients by being whole heartedly committed to our work responsibilities. We have highly equipped corporate offices and distribution networks that give us the strength to be consistent in our business processes. We own a team of highly passionate working professionals, who are greatest assets. We have open, trusted and accountable team leaders on board whose combined efforts bring vigor to other team members. Our product engineers, project experts, marketing managers and quality analysts have come from diverse background and brought with them rich skills set that make their actions causing a positive difference every day. Our driving force is innovation which is backed with a consistent series of research and development. We boast an exclusive product line that sets us apart from the rest for its reliability, and superior performance. We jointly strive to discover new ways to optimize the manufacturing process and make efforts to bring forth full scale production that is a perfect combination of efficiency and cost effectiveness. We work in adherence to the international guidelines and standards of quality. Our vision to become industry leading manufacturers of fitting industries made us highly focused towards the caliber of our product range. To achieve our goals, we follow rigorous quality practices, such as exploring the microstructure of the procured raw material, analyzing its efficiency and full scale testing phases for the finished products.